A complete whirlwind, or more accurately, a complete tornado is how I would describe the last week. Caleb's mom took a turn for the worse about five days ago. She suffered what we believe to be a significant stroke (even though the CT scan doesn't show any evidence of such.) Before you question the testing, she cannot have an MRI due to the metal aneurysm clips in her head. The tornado began on Tuesday evening. Caleb left work and headed to visit his mom at the care center. When he arrived, Jackie sat comatose in her bed, staring at the ceiling with her mouth gaped open. She could not talk. She could not close her mouth. She could not fixate on anything and stared into nothing. Caleb attempted to converse with her and get her to drink to no avail. Realizing the seriousness of the situation, he immediately called for her nurse. I won't get into our narrative of the care she received or the questions about how long she'd sat in her bed in this state with no one paying attention - or ignoring her condition. After Caleb's intervention, an ambulance arrived and transported Jackie to the emergency room. My parents (life-savers once again) came over to watch Emmy and Zoe, while I left and met Caleb at the hospital. When I arrived, I was in total shock at Jackie's condition. She sat propped up in the hospital bed, completely incoherent. Caleb and I remained at the hospital into the early morning hours. Once she was admitted and settled in, we returned home. Needless to say, we were exhausted and stressed. Over the next few days, Caleb stayed bedside and directed Jackie's physicians in order to establish her "baseline" physical abilities and behaviors. Her co-morbidities are quite overwhelming to anyone who reviews her chart. Caleb is an only child and Jackie's medical power of attorney. Since she cannot talk and is thoroughly confused when she does, he is her lifeline. Caleb and I will need to find a skilled nursing facility and ultimately a group home for Jackie. Her current status is tenuous, at best. She is beginning to talk once again, but remains confused, demented, and struggles with eating and drinking. She will need to undergo physical, occupational and speech therapy - all of which will likely not bring her back to "baseline." The past several days have been more than challenging for us. And, unfortunately, compassion does not come easily to all that surround us and additional stress has been placed on our family. Please pray that Jackie's health improves and that we can work through the challenges and maze that we are mired in right now and that we come out stronger and better on the other side. This afternoon, Emerson helped mommy put together a storage unit for Zoe's stuff - as she requires more items than a typical baby. Emmy was quite proud of herself. Caleb got out of the house with Emmy today for a dinner date with Grandma and Grandpa and some friends, Cliff and Karen, who helped us out tremendously while we were all in Philadelphia. Emmy dressed in her new outfit and mom got a shot of her during her get ready process. She is such a ham and makes me laugh constantly. Even though we didn't leave the house, we had a great Father's Day. Zoe enjoyed hanging with Dad and Tummy Time. Grandma and Grandpa Muenich came to pick up Emerson and took her to see the Greats and to visit Grandma Jackie. When they returned, we took some dads and daughters pics. Emerson refused to cooperate. As usual, she just wanted to sing, dance and goof around with Papa. Yesterday, I took Zoe to the doctor to get her blood drawn once again. This time, I was really hoping she'd cooperate, but no such luck. It took 3 pokes to get her to give up 3 mL. She no longer calms with sugar water and chose to scream the entire time. The stress wore both of us out! Things are going as well as expected at home. Zoe continues to gain weight. She eclipsed 8 pounds yesterday. We're pushing her to continue gaining and growing - the goal is lung maturation for her Stage II surgery. She is finally used to mommy's poking and prodding all day long. She really is a trooper! All of us Lihns continue to be amazed with Zoe and are her biggest fans. Thanks for continuing to cheer us on each and every day. It's only when you grow up and step back from him - or leave him for your own home - it's only then that you can measure his greatness and fully appreciate it. Wishing a Happy Father's Day to my Dad and Husband, two men that would sacrifice anything for their daughters. I am a lucky daughter and wife! Just wanted to share my new favorite song. Ryan Star. Ever heard of him? I can tell by your face, No. On Thursday, just a few hours after my last post, I caught Emerson peeking in on Zoe during a nap. After that, I asked Emerson if she wanted to hold her little sister. Hesitantly, she responded with a nod. I helped her get situated and passed Zoe over to her. Emerson sat there completely frozen and held Zoe. Zoe didn't mind at all and nearly fell asleep in Emmy's arms. 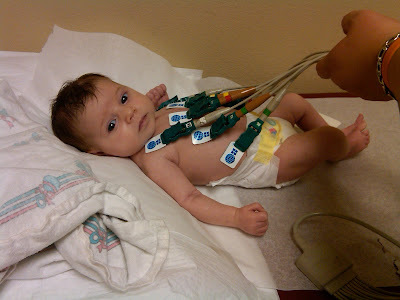 Yesterday, Zoe had another cardiology appointment. She received another thumbs up, all things considered. Assuming no problems arise, we don't need to go back for 2 weeks. Zoe, however, does need to get her blood drawn on Monday to check her anti-coagulation levels. I pray that the phlebotomist is skilled, as Zoe is extremely stingy with her blood. I tell her if she would just give it up on the first try, she wouldn't have to be poked in all 3 available extremities. Perhaps a little pep talk Monday morning will suffice. Today, Saturday, is clean the house day. A desperately needed activity. What are the odds Emmy cleans up her playroom all by herself?! My guess is, not good! We'll also drive around as a family in search for an assisted living home for Caleb's mom. She is currently in a care center in Glendale undergoing evaluation and physical/occupational and speech therapy. Her cognitive abilities have diminished in the past few weeks as she is suffering from dementia. Caleb had a tough visit with her yesterday, as she grows more frustrated and angry, wanting to go home. She does not understand why "everyone" is against her and not allowing her to "get better" and "return home so she can just live again." We ask for continued prayers for Jackie, and for Caleb, who is under tremendous stress between work, home, and visiting his mom. Even though things around our household are stressful, we can always count on Emerson to keep things light-hearted. Yesterday, Emerson played dress up while Mom and Zoe watched the United States get robbed of a win in the World Cup. Thanks Erin and Marie for my fancy shoooooozzzz! And a huge THANK YOU to all of our family and friends (both old and new, near and far) who continue to support us through our journey. I'm pretty sure Zoe gets cuter each day :) Emerson warms up to her a little more each day also, so she must agree. Emerson must know that Zoe is fragile because she really does handle her with kid gloves. She softly kisses her head and gestures that she is tickling her toes, but hasn't quite made contact with those little tootsies. I asked Emmy if she wanted to hold Zoe yesterday. Her eyes got big and she replied, "oh, no." I think by this weekend, she'll be up for it. Emerson keeps me laughing often. Yesterday I walked in on her rolling around on the floor, throwing her hands up in the air and turning in circles. I stopped and observed her, wondering what in the world she was doing. I looked up and saw the Fresh Beat Band on tv; they were break-dancing. Ahhhhh, Ms. Emerson is now working on her break-dancing skills. I think she enjoys the independence she gets while mommy is taking care of Zoe. She can trash the house in less than 5 minutes! While confined to the house during the day, I've been able to connect with my fellow heart moms via Facebook. I have found so much support and comfort in them. We share our concerns daily and swap weights and reflux stories. It really does help to know that I am not alone in this journey. Sure, doctors are great, but they don't offer the tremendous amount of emotional support a heart mom needs. We're all in similar boats, have the same concerns and worries and realize that each day with our children is truly a gift. Well, my time is up. Zoe is paging me with her cries. Next post, I'll be sure to upload some photos. Then, you can decide for yourself if Zoe is in fact growing cuter each day. Well, we made it! The flight from Philly was uneventful. Zoe wore her nasal cannula, which pumped oxygen into her nose, the entire flight (pulling it out more than once) and maintained good color with only a few bouts of blue. When we arrived home, Emerson was already there to greet us. She'd torn into her toys and began making a big 'ol mess. I have a good feeling the house will be a mess for several months to come. Life is hectic, but we couldn't be happier to be home. Mommy, Zoe and Emmy had a chance to relax on the couch for a bit. And, yes, mommy felt as tired as she looks! Zoe had her first Arizona cardiology appointment and was quite cooperative. 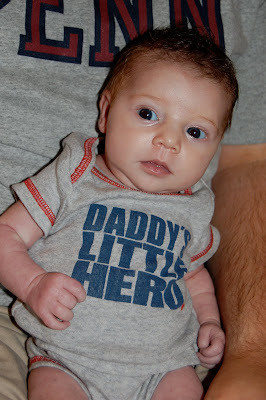 The doctors did worry us, however, with Zoe's "high risk" status due to the clotting and continued shunt narrowing. We were given instructions on what to do in case of an emergency. I asked the doc if a clot in her shunt is fatal. The answer I knew was coming, did in fact come..."yes." The aspirin and Lovenox injections are very important for Zoe and will be continued until her second surgery. We've been instructed to call CHOP in 2-3 weeks to schedule her second surgery for mid to late August. In Zoe's case, the sooner the better. We'll be following a strict home monitoring protocol which is intended to reduce inter-stage deaths. There is a ton to do around the Lihn house. Currently, I'm not certain how all of it will get done, but it will. Somehow, someday. For now, we're just enjoying our beautiful little girls and making the best of each and every moment. Please continue sending happy thoughts and prayers for Zoe (and her mommy and daddy could use a few as well.) Caleb's mom continues to struggle. She was placed in a skilled nursing center, but this morning was taken back to the hospital for worsening confusion and delusions. We're taking this a day at a time and will have to figure somethings out in the near future - as Caleb is her only child and power of attorney. Unfortunately, we won't be able to have any visitors any time soon. Zoe's condition is much too tenuous and any viral/bacterial infection could cause major problems for her. She'll be a bubble baby for the next several months. We'll continue to post photos so ya'll can see our warrior on a regular basis. Zoe visited CHOP this morning for her final EKG, ECHO and vitals check before receiving the green light to go home. The EKG and vitals were good, ECHO gave us one more thing to worry about. On the ECHO, the cardiologist noted that the lower portion of Zoe's shunt (the left pulmonary artery branch) has narrowed since the placement of the stents. She stated that this is not totally uncommon, given the location of the stents (at the top of the shunt.) Basically, the 2 stents caused the lower portion of the shunt to torque/pull up a bit - meaning Zoe is at an even higher risk for developing life-threatening clots in her shunt. Zoe's doc informed us that Zoe will need to remain on the Lovenox (injectable anticoagulants) until her Stage 2 surgery ("the Glenn"). The Glenn typically takes place anywhere from 4-6 months. Given the ECHO results today, they want to perform Zoe's Glenn closer to 4 months, and possibly even sooner if she's ready. "Ready" is defined by weight, so the faster Zoe gains weight, the better. Per Dr. Spray, Zoe's cardiothoracic surgeon, performing the Glenn at or before 4 months helps to reduce interstage deaths. Please continue to pray for our sweet princess that she has no complications between now and her Stage 2 surgery. 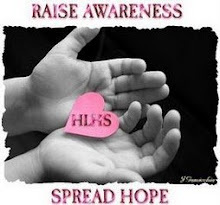 As all heart moms know, making it to the Glenn/Stage 2 surgery is when everyone can breathe a sigh of relief. Zoe is not out of the woods yet. She still has a long, long road ahead of her. She is an amazingly strong and beautiful little girl. We are so proud of her and happy to be heading home tomorrow. We'll then be able to settle in at home and resume a "normal" life. This afternoon, Caleb and I will be packing everything up to head home, including this beast of an oxygen tank. The doctors refer to it as "portable", however, I don't think that is a good descriptor! For the first time, two days ago, I went out for my first Philly-Zoe shopping spree. While at H&M, I found this little outfit for Zoe and couldn't leave the store without it. Zoe already has her first slew of doctor's appointments scheduled upon our return home. She'll likely be visiting her cardiologist, Dr. John Stock, on a weekly basis. Although, we are all more than thrilled to be going home, the departure is bitter sweet - more sweet than bitter. We've grown to love the City of Philadelphia, the comfort of CHOP and our new heart family - some of whom came and left before us and some of whom we are saying goodbye. Many of my fellow heart moms have expressed their survivors guilt upon leaving. Both Caleb and I feel that guilt; particularly when saying goodbye to those still struggling at CHOP. Each day is a battle at CHOP. Many battles are won and sadly, some are lost. I'd like to take this opportunity to thank my fellow heart moms and their brave and strong children whom we've come to know very well - through laughter, frustration and tears. Kathy and her sweet son, Jacob; Jen and Ray and their twins, Mia and Madden; Joy and her daughter, Jilly; Christina and her fighter, Emma; Senalda and her son, Charlie; Lisa and her twins, Jack and Nathan; Christa and her daughter, Gabby; and Laura and her angel, Gwen. I thank you all for your words of wisdom and strength. You've made us stronger people and better parents. We're inspired and in awe of each and every one of you and look forward to continuing our friendships outside of these CHOP walls. Heart hugs to you all. Tomorrow will be a long, stressful day of travel followed by several hurdles to overcome in the next few years. Zoe's Stage 3/Fontan procedure, which will be the final stage in reconstructing her heart, takes place between ages 2 and 3. Please continue to keep us in your thoughts and prayers often. We'll continue to update our blog and let you know what we're up to. So, instead of taking Zoe out for a morning walk in the park, we ended up in the Emergency Room. Before ya'll panic, everything is fine. Yesterday afternoon, Caleb and I assessed Zoe's surgical site. The day of her discharge, it appeared red which concerned us. The resident took a look and stated she "was not concerned." We were instructed to keep an eye on the site and call if we noticed any changes. And we did. Caleb phoned the cardiology attending on-call and voiced our concerns over continuing redness and newly arriving pustules at the top of her previously healing scar. The cardiologist asked us to bring Zoe to CHOP's ER for a wound check. We hopped into a taxi (Zoe's second taxi ride) and returned to CHOP. I must admit, I felt a sense of PTSD upon walking through the double, sliding glass doors. Zoe, defined by ER staff as a "Spray cardiac baby", received preferential treatment. No waiting for Zoe. Nice, but also a stark reminder at the seriousness of her condition. 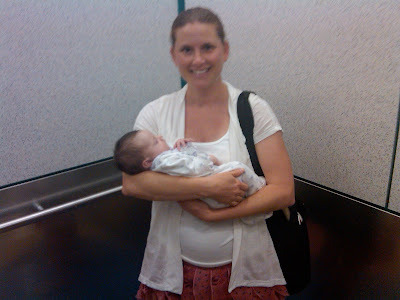 We were whisked into a separate area, away from all the other babies and kids in the ER. Immediate vitals taken and a private room. Zoe was seen by 1 nurse and 2 doctors before the ER decided to call the cardiology group for their trained eye. Cardiology believes Zoe's site is "irritated" and not infected. She has no fever, is eating well and acting herself. We felt relieved, but were again asked to keep an eye on the site. If we notice any changes we are to "come back." So far, so good. In fact, today the redness is down and looks as though it is trying to heal itself. 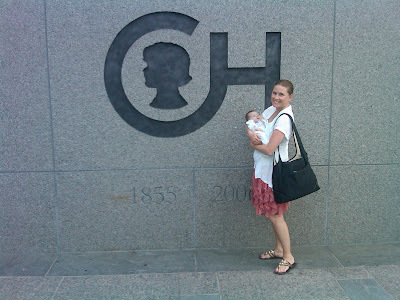 And then, just a few hours later, spotted on the corner of 18th and Walnut, a 7-pound warrior and her proud mommy. We ventured out for a short 10-minute walk in the park - Rittenhouse Square. Zoe loves the outdoors and her eyes lit up while gazing up at the trees. We'll have to go on another park outing soon. Although the fresh air is nice, most of my time is spent in the room, photographing beautiful Zoe. Zoe has an appointment with the lab at CHOP tomorrow for blood tests. The test will check her clotting time to be sure her anti-coagulant injections remain at theraputic levels. Then, on Wednesday, another appointment with her CHOP cardiologist. Assuming all goes well, we will gather our things (which have muliplied over the last month-plus) and beeline to the airport (oxygen tank in hand). The Lihns plan to be back in Arizona, at home, on Thursday evening! Mommy and Zoe logging off. Thanks for visiting us today. Yep, that's right. Our days are filled with all things baby - with a few additions. Medications, wound care and keeping a very close eye out for any signs or symptoms of congestive heart failure. This is our new life, and we wouldn't change it one bit. Zoe is absolutely precious. She continues to amaze me, her daddy and health care providers. Yesterday, we were visited by a home health care nurse who was shocked at how great Zoe looked. She, and the doctors at CHOP, encourage us to get out into open air and not be locked up in the hotel. Such statement is easy for them to make, particularly when their child's life does not depend on staying 100% healthy. One simple cold or infection could be life-threatening. We learned this reality all too well when one of our heart mommies, Laura Carpenter, lost her precious 2 month old Gwen to a simple infection. I talk to Zoe about her angels each day. Zoe looks all around her, seemingly into the air, but I'm certain she is looking at all of her angels, including Gwen. We are very much looking forward to going home next week. We will miss our home-away-from-home, Philadelphia. It is quite a great city, but the humidity is starting to really get to us. We may (I repeat, may) venture out to walk at the park across the street today (per doctor's orders.) If so, we'll post pictures later of Zoe's first adventure. Love to you all. Thanks for following our beautiful Zoe and supporting us all along. P.S. We are all jealous of Emerson, grandma and grandpa. They are flying home to Phoenix today! P.P.S. 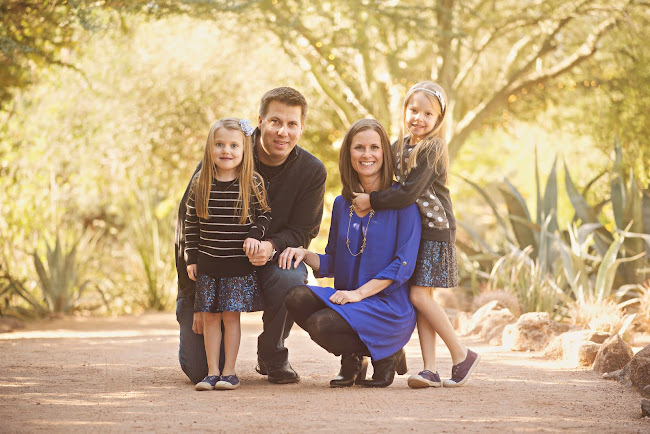 Prayers are still needed for Caleb's mom, Jackie, who remains in the hospital in Mesa, Arizona. Goodbye to CHOP, for now. As planned, Zoe left the hospital today. She will return next Wednesday afternoon for a final visit and exam, before we return to AZ. The room we had at the Ronald McDonald house was too small, and didn't have a full shower, so, now that we have Zoe, we decided to get a hotel with a kitchenette. So we moved (again) this morning, then returned to CHOP to get Zoe! Zoe is now back at the hotel with us. 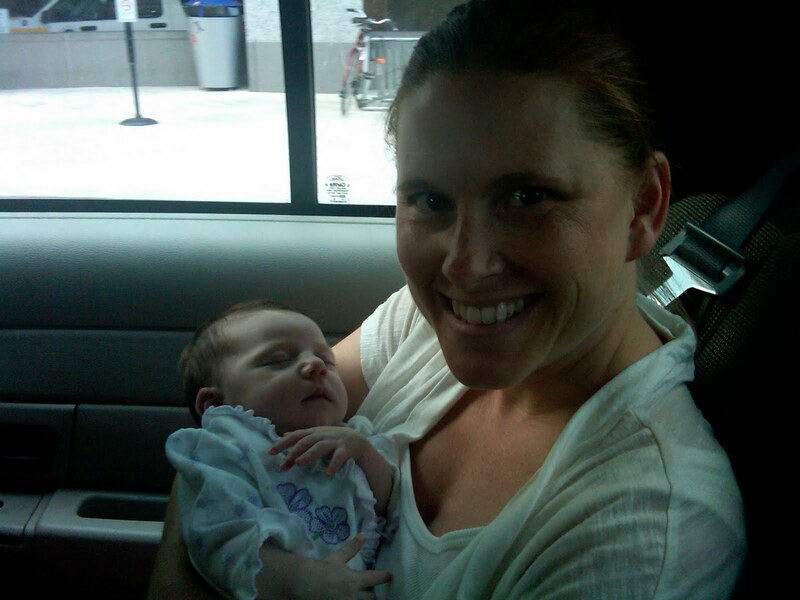 She slept through her departure, through her first cab ride, and for the first hour or so at the hotel.